We partner with nonprofits in the Dominican Republic on community service projects to provide the support that locals need. We provide trip opportunities for groups in PA, NJ, and beyond. Join service learning programs traveling overseas from Bucks County, Chester County, Montgomery County and beyond. On this international trip you will provide voluntary service while also working side-by-side with Haitians and learning more about Haitian culture. Haiti volunteer opportunities abroad are designed to provide community service and meaningful work on projects needed for sustainability in Haiti. All of this occurs while supporting a development aide organization in Haiti. Our community service programs abroad allow students to partner with local aid and development organizations to provide the support needed most. If you are located in PA, NJ, or elsewhere, contact us about a trip abroad. Run a Volunteer Service Program with ILI! ILI Travel works with schools and teachers, professors and colleges, Girl Scouts, non-profit leaders, and many others in service learning projects at home and abroad. Traveling to another country for service learning can be a life-altering experience; many volunteers never look at the world the same way again. We work closely with non-profit organizations in the Dominican Republic and Haiti to ensure that our work furthers their needs for empowerment and sustainability. “The Dominican Republic trip was the BEST week of my life!” exclaimed Emily, a student from Montgomery County. That’s why high school teachers are running similar volunteer service programs overseas, as teens are finding that they are growing from their volunteer work abroad in ways they couldn’t have imagined otherwise. In fact, one of our teachers who is running a similar international trip next summer saw 22% of their students returning from one year to the next. We work with college professors running international social justice work projects overseas, working closely with local non-profit organizations. 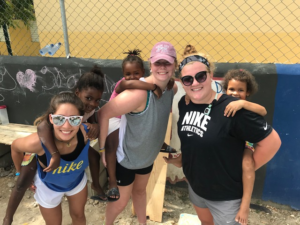 In the Dominican Republic, some groups visit a Dominican prison, meet with an NGO to work on reintegrating inmates into society, and volunteer with a nonprofit empowering young girls living in extreme poverty. These volunteer travel programs integrate social justice to better understand the public and private advocacy at the heart of efforts for social change in the country we visit. Are you looking for teen trips abroad for your students? We send youth groups of 12-50+ students to support local communities on locally-identified needs through our various volunteer service programs. Are you looking for service trips for college students, or are you looking to combine service with a social justice tour of nonprofits in the country while learning more about their mission? We have voluntary service/social justice programs for colleges and universities. Are you looking for a philanthropic service learning program for your YMCA, Girl Scout troop, Boy Scout troop, or other youth community organization? If so, our volunteer service programs can integrate the values of your organization into an international service learning opportunity for a true cultural exchange. Are you looking for a non-religious mission trip? We can provide service learning for your interfaith group through our volunteer service programs. During our service trips, we act as guests in their country, joining in service in ways that leave a behind a positive impact. We bring students from PA, NJ, and other areas, to collaborate with philanthropic groups in these countries because we are committed to supporting communities according to their needs. We stay in locally-owned hotels and eat in locally-owned restaurants, because we believe in directly investing our money in the communities we serve. We offer service learning throughout the year, though summer trips are in highest demand. In our programs, students have the opportunity to do everything from running summer camps and painting schools to working with children living in extreme poverty and teaching English. Through the totality of the efforts of all of our groups, we collectively work to transform a community. Start Your Volunteer Service Program Today! Are you ready to begin planning the experience of a lifetime? Reach out to us today!